For a second consecutive season, the Oregon Ducks will have to figure out a way to win without star RB Thomas Tyner. On Sunday, it was announced that Tyner will miss all of the 2015 season due to shoulder surgery, a blow to a Ducks’ offense already struggling to find an identity in the wake of Marcus Mariota‘s departure. Famous for their running back-by-committee approach, head coach Mark Helfrich, offensive coordinator Scott Frost, and most importantly, sophomore RB Royce Freeman now have a tall order in front of them. 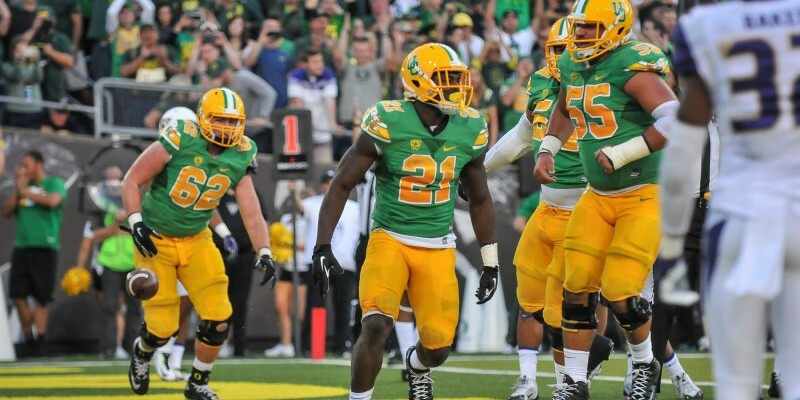 The Ducks will miss Tyner’s strength and versatility this season. Last season, Freeman wowed Duck fans after emerging as the clear No. 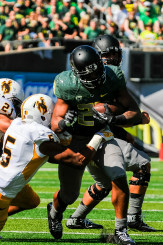 1 option in the Ducks’ backfield following Tyner’s injury. By the time Tyner returned, Freeman had established himself as the primary back and Tyner struggled to work his way back into the rotation. But, after an off-season of rest, Tyner and Freeman were expected to duke it out all the way up until the season opener against EWU to see who could earn the starting nod. Well, as the saying goes, one man’s loss is another man’s gain. With Tyner out for the season, Freeman is once again thrust into the spotlight. Now, this doesn’t mean Freeman will be the only back awarded carries. There are plenty of young – and old – backs that Helfrich and Frost plan to use. Tony Brooks-James has shown flashes of tremendous promise, and returners Kani Benoit and Byron Marshall should be able to shoulder some of Freeman’s rapidly-growing workload. But, for Freeman, this time around signifies much more pressure. Whereas, last season when the Ducks’ offense flailed against the likes of Arizona and Ohio State, games in which critics were quick to blame Mariota, Freeman will no longer have a scapegoat. Already the face of this young offense, Freeman now will be forced to face heavy criticism, as well as looming expectations. He was already tabbed as an early favorite to compete for the Heisman trophy, and with Tyner’s injury, the stakes are that much higher. Now, I don’t doubt Freeman possesses the ability to meet, and even exceed all expectations set for him. His rare combination of power, speed and vision is reminiscent of Jonathan Stewart as many coaches will agree, but football is an 11-on-11-man sport. No one man, not even Mariota, could win a game on his own. Tyner’s injury will call for all members of the offense to step up their game, especially considering that defenses will be keying on Freeman even more. While before the Ducks had balance to their rushing attack, it is now filled with vastly unproven, albeit heavily hyped, talent. Freeman will be expected to improve upon his nearly 1400 yard freshman campaign. With an unknown QB and an on-the-mend offensive line, no group will be under more scrutiny than the Ducks’ RBs this season. Expectations are high, rightfully so, and it is primarily up to Freeman to demonstrate leadership in a time of otherwise unprecedented adversity for this young offense. That said, Freeman has performed at his best when forced to shoulder the rushing attack. Tyner was first injured last season against the Huskies and didn’t return healthy until a full six games later. During that six game stretch, Freeman averaged 19.3 carries per game, rushing for 663 yards and 5 touchdowns on an astounding 5.7 yards per carry. Moreover, that doesn’t include the Washington game in which Tyner exited early when Freeman rushed for a season high 169 yards and 4 touchdowns. So, needless to say, Freeman has proven his ability to shoulder the rushing load. But, without Mariota by his side, Freeman’s task now shifts from shouldering a rushing load to shouldering an entire offense. He’s capable — that much is clear — but he’ll need as much help as he can get.